What makes the HIX Swingman 20 separate itself from the competition is the ability to apply 1200lbs of downward force with very little effort: Now press ceramic tiles, puff transfers, hot split transfers, glass cutting boards, rhinestones, nail heads, and more with use of only one hand. 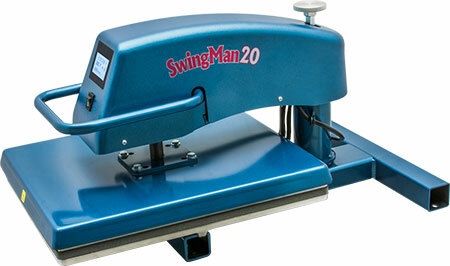 The Swingman 20 represents the latest generation in heat press design from HIX. The Swingman 20 features a 16" x 20" swing away heat platen that will meet the needs of any textile or sublimation business. With repeatable print gap settings up to maximum up to 1-3/4' thick, the Swingman 20 is great for tiles, plaques, garments and 3-D items. The heads up display also features digital time and temperature control from ambient temp to 450°. The over-center lever provides easy lock down with a full range of pressure adjustments which along with the easy-swing platen make the Swingman 20 one of the most versatile presses on the market.